Chicken Scaloppine with Green Beans – Chef Tom Cooks ! 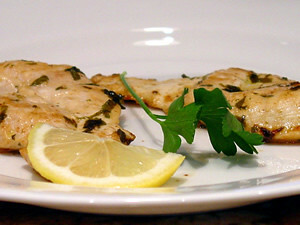 Enjoy this light and flavorful chicken dish. It’s easy to prepare and healthy. Steam green beans, covered, 4 minutes or until crisp-tender. Season with salt and black pepper, to taste. Place each chicken breast half between 2 sheets of heavy-duty plastic wrap; pound to ¼-inch thickness using a meat mallet or small heavy skillet. Season chicken evenly with ½ teaspoon salt and pepper. Heat a large nonstick skillet over medium-high heat. Coat pan with cooking spray. Add 2 breast halves to pan; sauté 2 minutes on each side or until done. Repeat procedure twice with remaining chicken. Add broth and wine to pan; bring to a boil, scraping pan to loosen browned bits. Cook until reduced to ½ cup (about 5 minutes). Remove from heat; stir in butter. Serve green beans with chicken and sauce. Garnish with lemon wedges.